Most organisms, including humans, have parasitic DNA fragments called “jumping genes” that insert themselves into DNA molecules, disrupting genetic instructions in the process. And that phenomenon can result in age-related diseases such as cancer. But researchers at the University of Rochester now report that the “jumping genes” in mice become active as the mice age when a multi-function protein stops keeping them in check in order to take on another role. In a study published today in Nature Communications, Professor of Biology Vera Gorbunova and Assistant Professor of Biology Andrei Seluanov explain that a protein called Sirt6 is needed to keep the jumping genes—technically known as retrotransposons—inactive. That’s an entirely different function from the ones scientists had long associated with Sirt6, such as the repairing of broken DNA molecules and regulating metabolism. For the most part, retrotransposons remain silent and inactive in organisms’ genomes. But once they do become active, these DNA fragments can duplicate themselves and “jump” to new areas of the genome, disrupting the function of another gene by landing in an important part of the gene and changing its DNA sequence information. 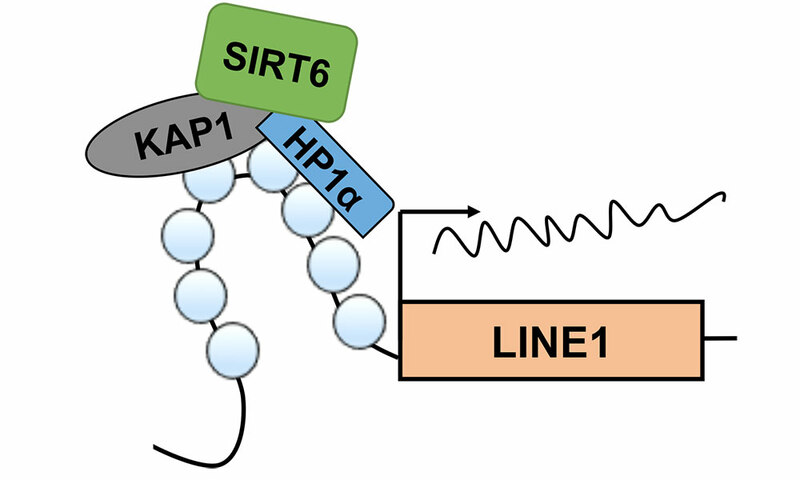 But what happens to the Sirt6 proteins that kept the jumping genes inactive in younger cells? The answer lies in the role that Sirt6 plays in repairing DNA damage. Cells accumulate a lot of DNA damage over time that needs to be constantly repaired. As cells get older, Sirt6 becomes busier in taking care of the DNA damage. Gorbunova and Seluanov hypothesized that Sirt6 becomes so preoccupied in repairing DNA damage in older cells that it is no longer available to keep the jumping genes inactive. To test the theory, the team artificially caused DNA damage in young cells using gamma radiation or the chemical hydrogen peroxide. Once the damage took place, Sirt6 was immediately recruited to the damaged sites of the DNA to do its repair work. Gorbunova and Seluanov found that the stressed cells—the ones with increased DNA damage—had a higher rate of “jumping gene” activity, when compared to the other cells. Then, when the amount of Sirt6 was artificially increased in the stressed cells, the retrotransposons did not become as readily active, keeping the genome safe.